Last week after the rain stopped, Jay and I brought the children outdoor to find the earthworms and insects. He dug the earth and out squirmed the wriggly earthworms. The children were terrified. Dot finally mastered her courage when she saw her dad holding the worm in his hand. She decided that she was brave enough to hold an earthworm on her palm. Her timid mommy just stood at one side watching, didn’t even dare to touch the worm. As we take time to walk around in our neighbourhood, I discover that the time we spend to observing nature makes the children more sensitive and aware of their environment. They can spot tiny creatures like this tiny butterflies, grasshoppers and even a tiny snail, which was barely one centimetre in length. We will usually bring a plastic container during our walk so that the children can observe the insects up-close. 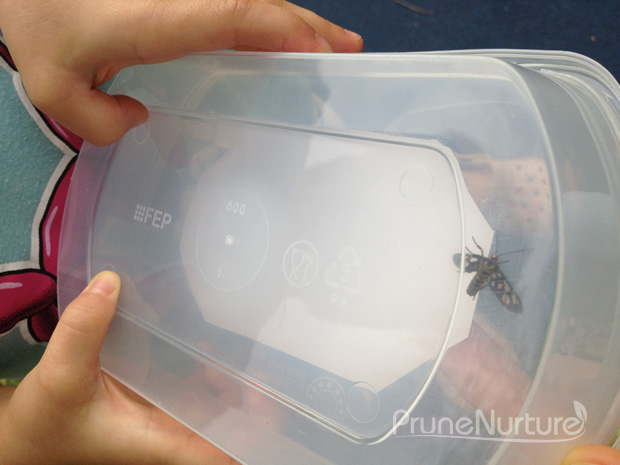 Recently, J caught a winged insect and a butterfly in a plastic container for the children to observe. The children were thrilled to watch them in close proximity. “Mommy, we have to release this butterfly. It belongs to nature, if not it will die.” Dot looked at the little winged insect we caught in a plastic container and remarked. The children learn to be quiet and observe when we are out for nature walk. I was just as excited when they found all these on their own on different occasions. 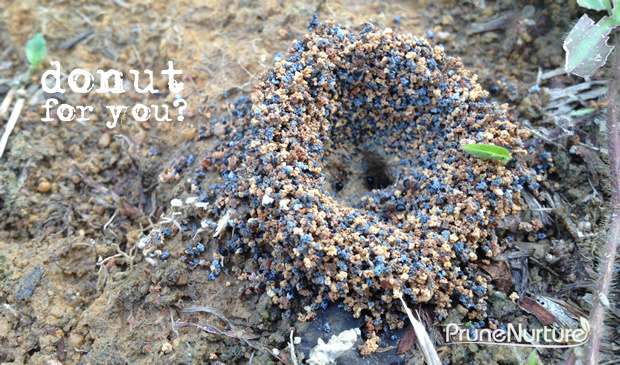 “This ant-hole looks like a do-nut.” remarked Joey. The children just stayed around and watched the ants carried little bits of soil from the ground and dumped them at the surface. Then they spotted a dying winged insect – a hornet? – on the ground. Be careful of the sharp stinger! Dot’s dad found some pods from a plant. 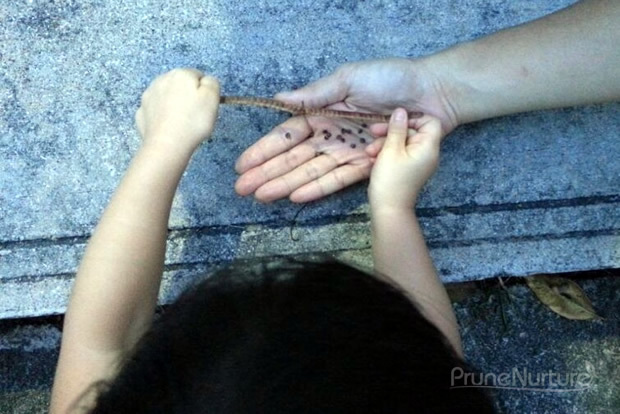 Dot broke the pod and the seeds came tumbling out onto her daddy’s hand. We spotted this cute little snail on our way home. Watch how this snail, who almost fell of the tip of the leaf, managed to do a U-turn and saved its own life in this video. We can still watch and observe nature in our urban Singapore. Take a slow walk in our neighbourhood and let nature fascinate you and your children. It sharpens our senses when we learn to take note our environment. Don’t be surprised that our children can observe and notice more things than us, adults.